Apple is planning a new campus in Cupertino, featuring a four storied circular building. 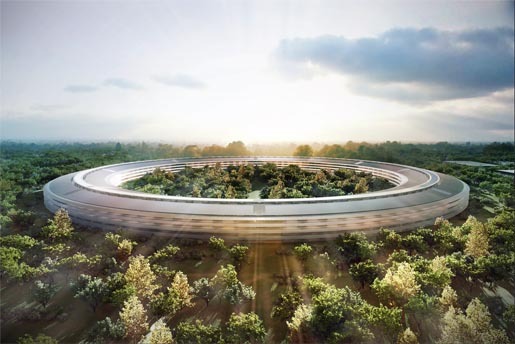 Cupertino City Council’s website includes a plan overview, elevations and landscaping diagrams, floor plans and space allocation, and renderings. The new building will hold 12,000 employees and is expected to be completed by 2015, placed on a 175-acre plot of land, along with a 1,000-seat auditorium, fitness center, 300,000 square feet of research facilities, a power plant, and underground parking. 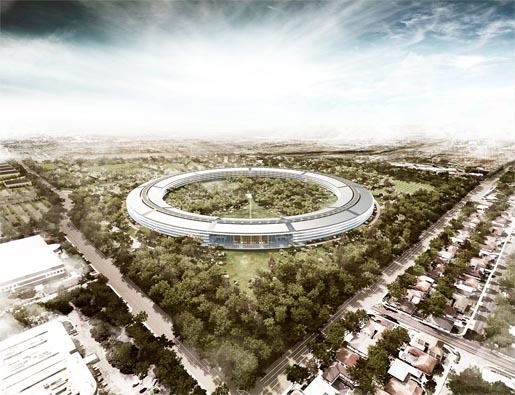 The Apple City complex was designed by architects Foster + Partners, London, engineers Arup, San Francisco, planning consultants Kier & Wright, Santa Clara.